The Radar Set AN/SPS-67 is a short-range, two-dimensional, surface-search/navigation radar system that provides highly accurate surface and limited low-flyer detection and tracking capabilities. The AN/SPS-67 is a solid-state replacement for the AN/SPS-10 radar, using a more reliable antenna and incorporating standard electronic module technology for simpler repair and maintenance. The AN/SPS-67 provides excellent performance in rain and sea clutter, and is useful in harbor navigation, since the AN/SPS-67 is capable of detecting buoys and small obstructions without difficulty. The AN/SPS-67(V)1 radar is a two-dimensional (azimuth and range) pulsed radar set primarily designed for surface operations with a secondary capability of anti-ship-missile and lowflier detection. The radar set operates in the 5450 to 5825 MHz range, using a coaxial magnetron as the transmitter output tube. The transmitter/receiver is capable of operation in a long (1.0 sec), medium (0.25 msec), or short (0.10 msec) pulse mode to enhance radar performance for specific operational or tactical situations. Pulse repetition frequencies (PRF) of 750,1200, and 2400 pulses/second are used for the long, medium, and short pulse modes, respectively. The AN/SPS-67(V)1 radar will be the primary surface search and navigation radar with limited air search capability, and will eventually replace the existing AN/SPS-10 series radars on some classes. The construction of the radar set is primarily solid state, with the exception of the transmitter magnetron and the receiver TR device. 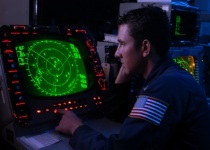 Miniature and microminiature technology are used extensively throughout the radar set. There are two other configurations of the AN/SPS-67(V), the (V)2 and (V)3. The AN/SPS-67(V)2 is identical to the AN/SPS-67(V)1 with exception of the antenna. This variant uses a standard surface search antenna. The AN/SPS-67(V)3 is ehanced from previous configurations. This radar has a signal processing unit that provides digital moving target indicator (DMTI) capability. The function of the DMTI circuitry is to automatically cancel unwanted fixed echoes (sea clutter, clouds, rain, etc.) and display only moving target signals.